Graduation day is a memorable occasion for any student – it marks the conclusion of years of study and hard work, it brings the hope of a more prosperous future and it empowers graduates with the sense that they now have the tools necessary to enter a fiercely competitive labor market. December 13, 2017 signified another milestone at Seminole State College of Florida. Those at the commencement ceremony were among the largest class ever to graduate from the college. Altogether, more than 3,500 students received their degrees and certificates that day. Seminole State’s record year of graduates indicates a larger trend: Orlando’s population has become increasingly educated and is closing the gap between the region and rest of the country. 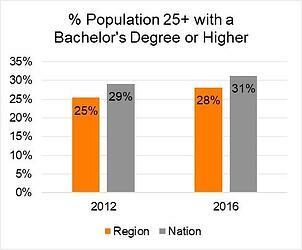 Since 2012, the number of bachelor’s degrees awarded within the seven-county region increased 11.8 percent, 3.9 percent above the national average during the same period. 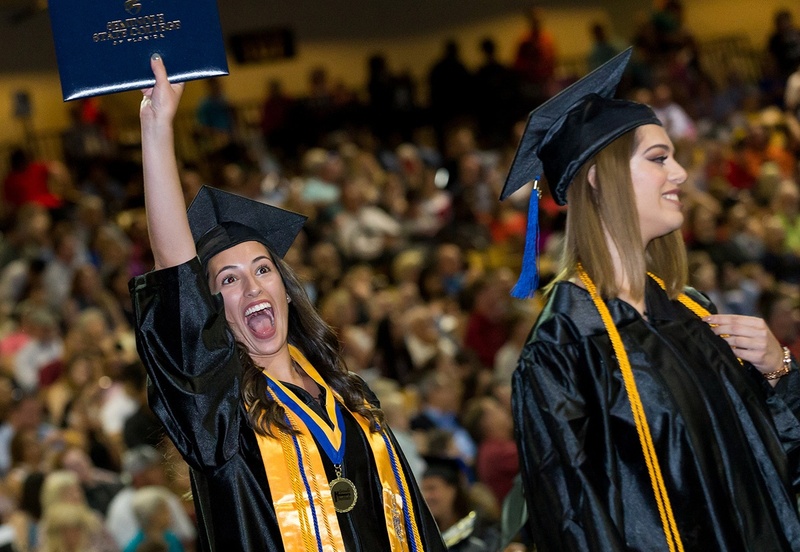 Over the last five years, an average of 23,500 baccalaureate students per year have graduated from Central Florida’s higher education institutions. Just five years ago, 25 percent of the population over 25 years of age had a bachelor’s degree or higher. 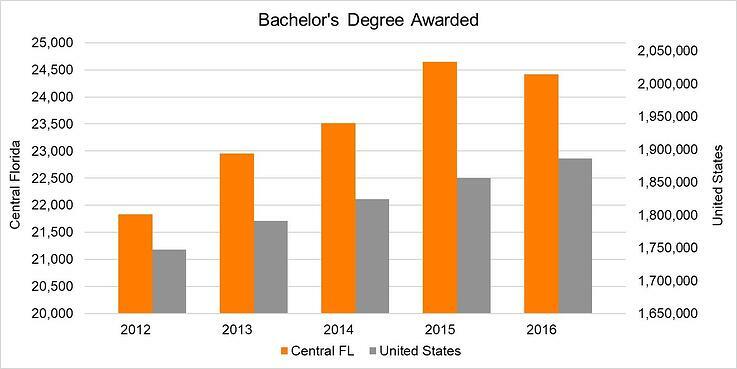 2016 data shows that same cohort gained three percentage points to reach 28 percent with at least a four-year degree; Central Florida now falls only three percentage points away from the national cohort. 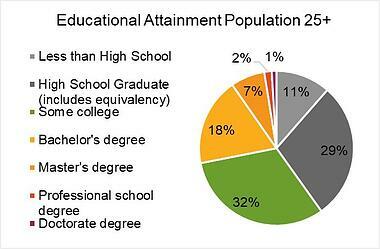 This data suggests that Central Florida’s increasingly educated population may be mostly home-grown. A 2016 survey from the University of Central Florida (UCF) found that 75 percent of UCF graduates who plan to enter the workforce accept a job within the 11 counties surrounding the school and that 90 percent stay in Florida. Assuming this is true for all the region’s higher education institutions, the Orlando Economic Partnership estimates that in 2016 alone, 25,600 recent higher education graduates potentially entered the workforce within the eleven-county region. Orlando’s higher education institutions are producing graduates at an accelerated pace from 2012-2016. The table below highlights 15 of the region’s fastest growing baccalaureate programs by percent change since 2012. With 500,000 college students enrolled within 100-mile radius of Orlando, the upward trajectory will continues, providing an educated workforce ready to fulfill a company’s need for qualified professionals well into the future. For the purposes of this report Central Florida is defined as Brevard, Lake, Orange, Osceola, Polk, Seminole, and Volusia County. Sources: Seminole State College of Florida, National Center for Education Statistics, University of Central Florida, Emsi Education Reports. Orlando Context is a series of timely analyses produced by the Orlando Economic Partnership. Analyses are associated with a major data release and place Orlando in a comparative context with other large regions. Want to get timely economic news delivered straight to your inbox?